The monthly meeting of the Frances Slocum Chapter of the Daughters of the American Revolution (DAR) took place on Tuesday, March 13, at the Grandstaff-Hentgen Activity Room, Wabash. The meeting opened with the DAR ritual. Devotions were for Saint Patrick’s Day from Psalm 24:5. The March President General's message from Ann T. Dillon was shared by Joyce Joy. To honor Women’s History Month in March, AMERICAN SPIRIT magazine’s March/April 2018 issue pays tribute to the many accomplishments of early American women, many of whom have gone unheralded for centuries. Renovations to the Museum Gallery and work on Phase Two of Constitution Hall should be completed before Congress, June 20-24, 2018. Wabash Musicale met March 27, at the Christ United Methodist Church with 21 members present. President Peggy Coppler greeted the ladies before turning the meeting over to co-chairwomen Carolyn Eppley and Luvernia Wilson. Crappie USA will hit the waters of Mississinewa and Salamonie lakes on May 12. This is an opportunity for anglers to compete for cash and prizes, as well as, a chance to advance to the 2018 Cabela's Crappie USA Classic. The Classic will be Oct. 3–6 on Lake Cumberland at Somerset, Ky., and will have a guaranteed payout of $125,000 in cash and prizes. A pre-tournament seminar will take place Friday evening, May 11, at Bozarth Recreational Resort & Country Store, 7309 E. 400 North, Largo. Sign up will begin at 5 p.m. with the meeting and a National Sponsor Field Test Product Drawing starting at 7 p.m. This seminar is open to the public. Organizers encourage those not fishing the event to come out to this meeting and meet the top crappie anglers from several different states. St. Paul’s County Line Church, 3995 North County Road 1000 West (county line), will host an all-you-can-eat tenderloin supper. The supper will take place on Saturday, April 28 from 4-7 p.m at the church. The Laketon American Legion Auxiliary Unit 402 hosted a local businessman during its March meeting. Legislative Chairman Mary Rohrer introduced guest Jon Albright, who operates King & Country Armory, located on Wabash Road in North Manchester. The firearms dealer opened in 2013. Albright, a veteran and past commander of Post No. 402, discussed the process of purchasing firearms, including the current universal background check system, and explained the meaning of an assault rifle. WASHINGTON, -- U.S. Secretary of Agriculture Sonny Perdue is encouraging dairy producers to consider enrolling in the new and improved Margin Protection Program for Dairy (MPP-Dairy), which will provide better protections for dairy producers from shifting milk and feed prices. With changes authorized under the Bipartisan Budget Act of 2018, the U.S. Department of Agriculture’s (USDA) Farm Service Agency (FSA) has set the enrollment period to run from April 9, 2018 to June 1, 2018. A youngster is serverd a slice of cake during the desert auction at the Ivy Tech Community College Wabash Campus' Monopoly Night fundraiser. Photo by Joseph Splacian. 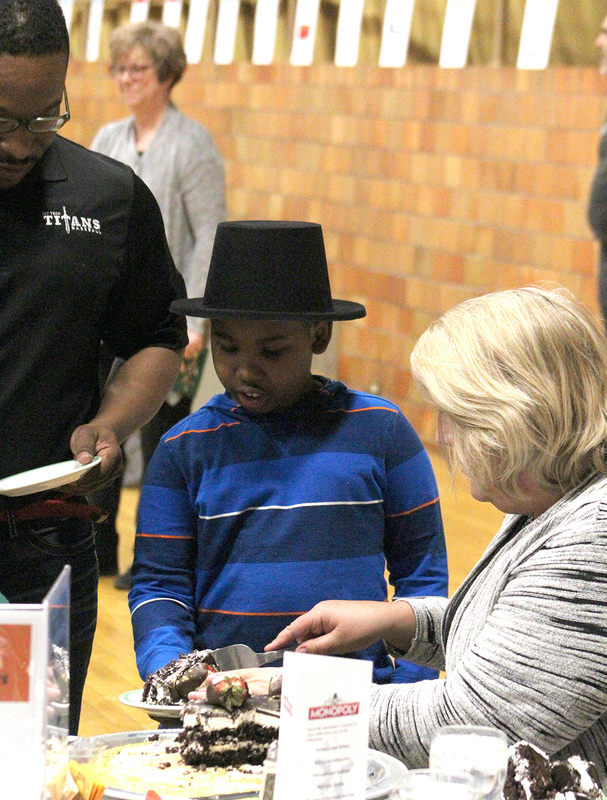 Ivy Tech Community College’s Wabash Site brought in $21,000 Friday night at Monopoly Night. All funds will benefit the Community Spirit Scholarship, which provides scholarships to Wabash County Ivy Tech students. Three Wabash County farm families were among those receiving the Hoosier Homestead Award, which recognizes farms that have been owned and maintained by the same family for 100 years or more.